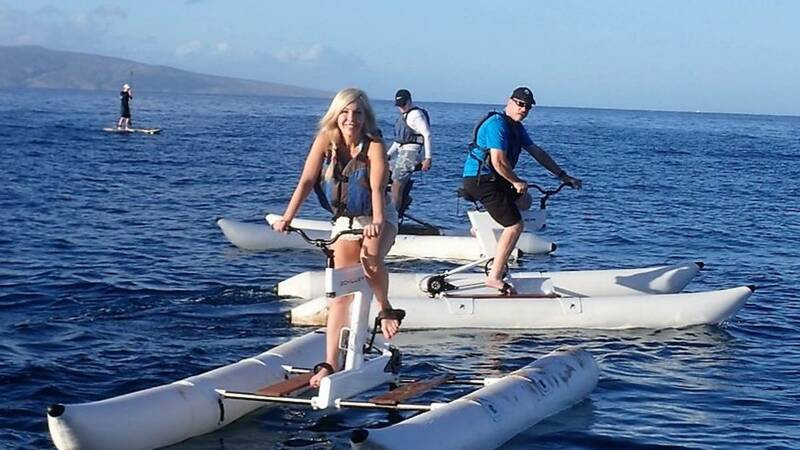 A guided or self-guided water bike adventure from Simon's Town is a safe and inspiring activity with the most spectacular scenery and marine wild life. GLIDING ACROSS THE OCEAN on the worlds most advanced water bike is a totally new and unique way to experience the incredible marine environment of the False Bay oceanic – known for its stunning ocean and mountain views and marine wildlife to be seen such as whales, dolphins, seals and the famous African penguin colony. If you can ride a bike with stabilisers, you will enjoy this. It was great fun setting out to sea un... - Suki Gibson. Book things to do at Cape Town Water Bikes. Find the best things to do at Cape Town Water Bikes. What people say about Cape Town Water Bikes. If you can ride a bike with stabilisers, you will enjoy this. It was great fun setting out to sea under your own steam, with a great view all around. We saw seals and penguins basking and playing in the water and although we had the two hour bike tour it felt like no time at all. Very enjoyable! Absolutely fantastic experience.... the girls did say the seats were a bit hard but ebjoyed every nano second. Well worth it and i truly hope u go from strength to strength. An experience that will be shared for long time to come. They loved the seals and penguins the interacted with whilst in the waterbike. Thank you so so much.